"I've no talent for life, there's nothing" says Hedda Gabler. Never before has this aspect of Ibsen's "bored to death" heroine been brought out more clearly. What we'll remember of Ruth Wilson's Hedda though is just how disagreeable she is. Wilson, a double Olivier winner and now a star in the US, thanks to The Affair, makes a triumphant return to the National under the direction of the acclaimed Ivo van Hove. van Hove recently said that for him Hedda wasn't just a victim of the rigid social conventions of her time but also a flawed manipulator. We feel for her being in this trap but her unhappiness stems from how she got there: the trade-offs she made for security, which then didn't deliver for her so she takes refuge in her ability to destroy others. She is after all fascinated by the kindly Mrs Elvsted who got out of her marriage and was redeemed by love. Her inability to do likewise is at the core of her unhappiness and her scathing dismissal of everyone, to her confidante and lover Judge Brack, speaks volumes about what a coiled spring of anger she is. It's a refreshing reading of the play and Wilson is glorious in how she orchestrates Hedda's many moods, from intelligence and playfulness to manipulation and self-loathing. With this production van Hove demonstrates again why he has gone from Benelux avant-garde to being one of the world's most acclaimed directors. Let loose on a classic he strips it bare and rebuilds, so it's like seeing and hearing it afresh. The settings are always vaguely modern but never time specific and his blocking eschews naturalism. It's the emotions he conjures up though which are key and these are always perfectly etched. Jan Versweyveld's designs, too, succeed in making really effective use of the vast width of the Lyttelton. The Tesman household is a stark modern apartment. 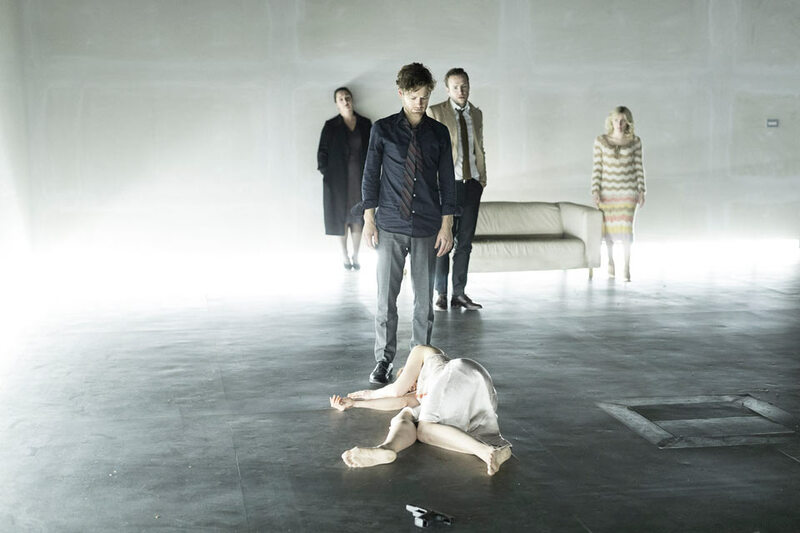 Three huge white walls trap Hedda in the space and other characters enter from the auditorium. It's almost as if she's a wild bird which got trapped in a gallery. There are also some wonderfully expressionistic flourishes, such as when she demolishes bouquets of flowers, some of which she then staples to the walls or, when the blackmailing Judge Brack sprays her with a red liquid signifying his control over her. Hedda is always an object and we see her husband, Tesman, revel in his proprietorship of her body. Fast rising American star Kyle Soller (of Poldark fame) gives a refreshing take on him. Instead of the usual wet rag, we get a more dynamic character: vain and selfishly absorbed. The other stand-out is Rafe Spall as Judge Brack who has the presence and swagger of a hedge fund king enhanced with a basso voice. He quickly takes control of every situation and plays Hedda for all she's worth. Tom Gibbons' sound design is ravishing and complements van Hove's clever use of songs by Joni Mitchell, Jeff Buckley and Nina Simone. It's certainly not your typical bookshelves and corsets Ibsen. van Hove has had an astonishing year with Tonys for A View from the Bridge and The Crucible, transferring the Bowie musical Lazarus to London and now this. All the while he runs the great ensemble company Toneelgroep Amsterdam and next year no less than 3 of his epic productions for them will visit the Barbican. Meanwhile this production will be broadcast live to cinemas worldwide on 9 March 2017 as part of NT Live.